The College of Communication and Information’s CI CoLab demonstrated how virtual reality works for a new series “Are you curious about…?” presented by UK Libraries. The event, “Are you curious about virtual reality?” took place September 12 in W.T. Young Library’s Alumni Gallery. 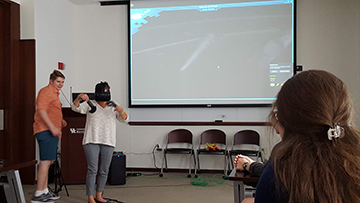 The CI CoLab demonstrated the virtual reality software, let audience members try out the software and then discussed the applications of the software. “We were excited to work with UK Libraries and have the opportunity to feed the curiosity of students. We would love to work with UK Libraries again in the future,” said Jesse Stallsworth, Director of Operations at the CI CoLab. The presentation also included some interesting history on virtual reality, what the future looks like for the software and some fun facts. For example, did you know that while virtual reality became publicly available only recently, the technology it employs has actually been around since the 1800s? The CI CoLab enjoyed the experience with students and is in the process of planning similar future events.